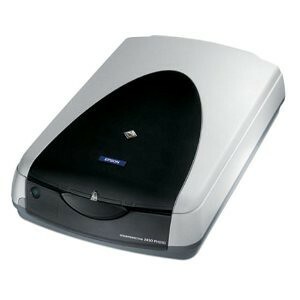 It was a major ordeal figuring out how to get this scanner, purchased in 2002, working in 64 bit Windows 7. It’s crazy, the thing is still available on Amazon after 8 years. It’s actually ranked #4 in Electronics > Camera & Photo > Printers & Scanners > Flatbed. Unplug the scanner from the computer. Go to the driver page for the Epson 4990, download, unzip, and install the driver by clicking the default selection in each dialog box presented. Plug the 2450 into the computer. Windows will not find the driver. Click the Windows start button, type 'device manager' in the search bar, then click Device Manager. Right click the EPSON Scanner device and select Update Driver Software. Click 'Browse my computer for driver software'. Click 'Let me pick from a list of devices on my computer'. Select 'Imaging Devices' and click Next. 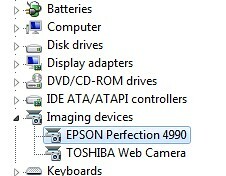 Choose Epson in the Manufacturer column and EPSON Perfection 4990 in the Model column. Click Next, then Yes, let the software install, then Close. Done! The scanner should now show up under Imaging Devices.